An inquiry came my way, some years ago, from a worried homeowner who had second thoughts about instructing his gardener to remove thirty yards of newly spread compost because it was full of what appeared to be tiny hopping insects. 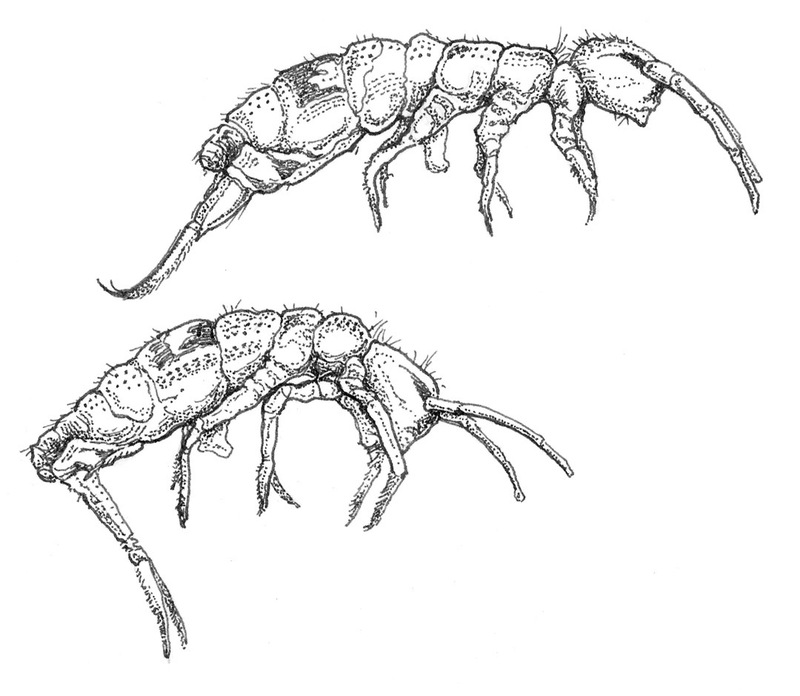 Springtails, the tiny arthropods that precipitated the hasty compost removal, are ubiquitous in gardens and play an essential role in decomposition of organic materials. They are seldom noticed but can be present in great abundance in leaf litter, compost, and other organic materials. Although the homeowner was relieved to learn that the compost was safe, the gardener may have been less pleased about having moved so much compost three times. The soil food web includes many species of tiny arthropods, known collectively as “microarthropods.” In an earlier article (see Pacific Horticulture, October 2010), we explored the almost invisible world of soil microorganisms: bacteria, actinomycetes, protozoans, algae, and others. Microarthropods and other small soil animals are visible (sometimes barely so) but miniscule; most require some level of magnification for identification. Many microarthropods, especially springtails and soil mites, are responsible for breaking down organic material into a form that bacteria can consume, and are fundamental to the creation of humus and the formation of soil. Biodiversity in the soil food web supports above-ground biodiversity. The thin layer where soil and litter meet is especially crucial to this process. This layer of soil is the most biologically active; many species of microarthropods thrive only in the interface between soil and litter. Others are found in deeper layers; these are often thinner, wormlike in form, with shorter legs than their counterparts in leaf litter. The distribution of differently adapted species in soil layers is a good reason to avoid disturbing soil layers whenever possible. For instance, in his book, Life in the Soil, James Nardi points out that springtail species may be separated by only a thin layer of soil, yet have an appearance and behavior distinctly different from one another. Soil mites are the most abundant soil microarthropods in all but arid and semi-arid environments (where ants play a leading role). About half of all mite species are soil dwellers; some are predatory, but most are scavengers. One scavenger is the tiny oribatid mite, the most abundant soil mite in the upper layers of soil. Sometimes called “seed mites,” they are able to close their “shells” and resemble small dark shiny beetles. Other mites dwell deep in the soil; little is known of their role. 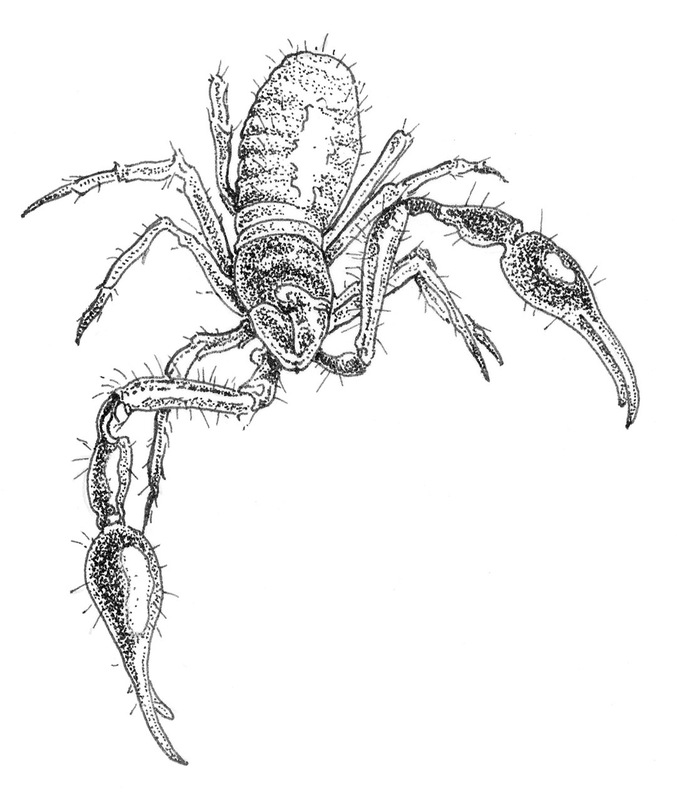 Pseudoscorpions are tiny, harmless arachnids (unless you are a springtail, their preferred prey) that look like miniature stingless scorpions. They often travel by “hitch-hiking” on larger organisms, such as daddy-long-legs and insects, a relationship known as “phoresy.” Many small species of spiders also inhabit leaf litter and the top layers of soil. Some species of centipedes and millipedes are found in soil; the tiny individuals may be juvenile forms of larger species. Symphylans are occasionally farm and garden pests. Symphylans generally eat decomposing matter; if populations increase dramatically, however, they can also eat roots. To avoid symphylan issues, compost that is not fully decomposed should be applied only as a surface treatment and not mixed into the soil. 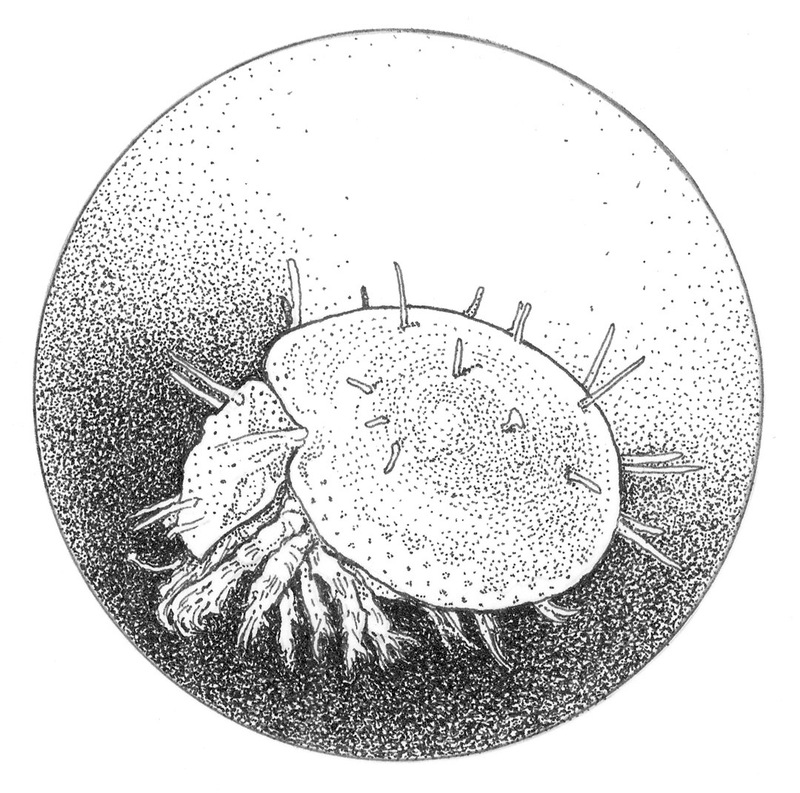 Crustaceans such as pillbugs and sowbugs have several miniscule relatives that may be found in water features; among these are copepods and daphnia. Look closely at a backyard pond, and you may see some of these interesting kinds of crustaceans swimming about. Numerous species of insects may be included with microarthropods. Even a seasoned beetle collector may be surprised at the diversity of tiny beetle species found in the soil. Ants, true bugs, crickets, and termites are all found in the soil and leaf litter. Several groups of arthropods with three pairs of legs, once classified as insects, have recently been moved into their own groups, based on differences in their mouthparts. In addition to the springtails, diplurans and proturans (blind, pale soil predators) have been moved into their own respective groups. Besides arthropods, other miniscule soil organisms are present. Rotifers are so small that they are often mistaken for single-celled protozoa, but they are actually complex animals. Although usually found in water, a few species are soil dwellers, and may be found in moss or lichen, navigating through a film of water in search of prey. If the soil dries out, rotifers may survive drought in the form of cysts and reanimate when conditions are suitable. Tardigrades can also reanimate; they are commonly found in soil, moss, and lawns, where they prey on protozoa and other organisms, and feed on algae and fungi. The health and sustainability of any landscape begins with intelligent stewardship of its most valuable resource: the soil underfoot. Soil is not simply a canvas on which we paint our beautiful plant pictures, but rather a living substrate. A good gardener, before anything else, tends the soil-the foundation of the landscape. We believe that we are growing plants, but we are really growing soil. When we proudly show off our prize tomatoes, we might, just as proudly, show off a handful of the soil from whence they came. Soil microarthropods include chelicerates (mites, spiders, and pseudoscorpions), myriapods (centipedes, millipedes, and symphylans), crustaceans (small aquatic forms often found in water features), springtails, and insects. Many groups do not have popular names; proturans and diplurans, for instance, are small soil arthropods related to insects. Worldwide. Many species of microarthropods have not yet been described. Some microarthropods are capable of parthenogenic (asexual) reproduction; for instance, orobatid mites have no need for males to reproduce. Rotifers and tartigrades share this efficient means of reproduction. Varied and diverse; although many can be spotted with the naked eye, magnification is an essential gardening tool for clear viewing of these tiny organisms. Varied. Most are short-lived. Microarthropods may have multiple generations annually. Those that can form cysts may be able to endure years of drought; these include some crustaceans, rotifers, and tardigrades. Varied. Some microarthropods function as decomposers; many are predators of other small organisms. Microarthropods contribute to a healthy soil ecology, especially to decomposition of organic matter in soils and mulches; many control populations of injurious organisms. Symphylans may eat roots if an excess of poorly decomposed organic material is mixed into the soil. Tardigrades share an exoskeleton in common with arthropods. They are able to dehydrate and “shut down” their metabolism, forming a cyst resistant to extremes of humidity and temperature (a process called cryptobiosis). They have been revived from dry specimens of museum moss after over a hundred years. When sufficient organic matter and moisture are present, an abundance of microarthropods is sure to be present. Life in the Soil: A Guide for Naturalists and Gardeners, James B Nardi. An essential text on soil; engaging and informative, with wonderful illustrations. Dirt: The Ecstatic Skin of the Earth, William Bryant Logan. A natural history of soil; shares a great appreciation for the world beneath our feet. Dirt: The Movie. Narrated by Jamie Lee Curtis, a wonderful, eye-opening look at soil. http://www.uni.illinois.edu/~dstone/microarthcollectionandexam.html. This university website is lesson based, with great links for those who wish to further explore microarthropods. http://www.magiscope.com/ A magiscope is a wonderful little field microscope for use in identifying both macro- and microarthropods. Far more than a child’s toy, it is useful for gardeners and amateur naturalists looking for affordable, sturdy magnification.